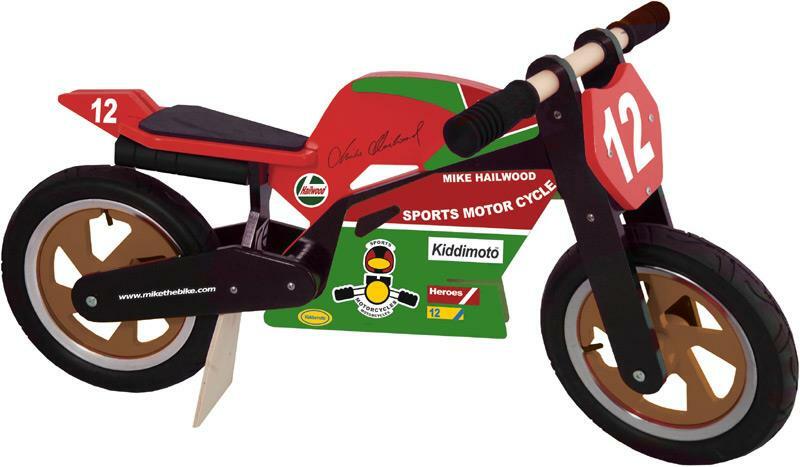 The latest race replica from Kiddimoto celebrates Mike Hailwood’s 1978 TT comeback victory. The wooden bikes are designed to help 2-6-year-olds learn the art of balance and co-ordination at an early age. The Hailwood bike (like the replicas of Joey Dunlop, James Toseland, Carl Fogarty, Nicky Hayden, Troy Corser, Kevin Schwantz, Eddie Lawson, Wayne Rainey, Neil Hodgson and Barry Sheene also in the range) costs £119.99.